Electrically driven irrigation systems require 480 VAC, three phase, 60 Hertz power with an equipment ground to operate properly. This may be provided by the power company, by a generator or a phase converter. Design of the electrical service and the system electrical conductors take the same consideration as does the water (hydraulic) supply system. As with the hydraulic design, we first have to determine the end pressure. Unlike the hydraulic end pressure that we could select depending on the type of sprinkler package, there is a set minimum voltage (pressure) at the last drive unit – Standard Electric 440 VAC, Standard Corner 450 VAC. All electrical design is based on this voltage at the end drive unit. It is now necessary to size our supply wire and system wire so that we have at least minimum voltage available at the end drive unit during peak loads. Electric conductors, such as used on electrically driven equipment, have resistance to the flow of electricity (electrons). This is much the same as friction loss in a pipeline. The majority of systems have 10 gauge copper wire as the 480 VAC, three phase conductors down the system. #8 gauge copper conductors are required when the voltage drop down the system reaches 20 volts with 10 gauge wire. Eight gauge wire, which is larger than 10 gauge, has more current carrying capacity and thus less voltage drop. The system voltage drop will be improved one volt per span up to 75% of the length of the system by use of 8 gauge wire. Very little is gained by adding 8 gauge after that point. You must determine the minimum pivot voltage required to provide ample voltage to the end drive unit. Voltage drop for the system installation is calculated to insure a minimum of 440 volts on Standard Electric, 450 volts on Standard Corner at the last drive unit. Under many soil and terrain conditions, it is possible to design systems that are capable of operating with greater efficiency by incorporating larger system pipeline sizes or low pressure sprinkler packages to increase HP savings. 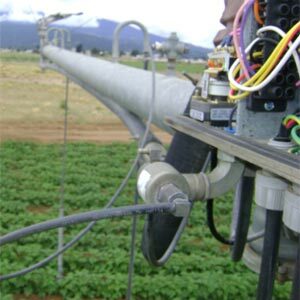 There are several power alternatives available for irrigation water pumping and powering the irrigation system. Each of these should be investigated to select best overall design. The availability and distance to 480 volt, 3 phase, electrical power may determine whether electrical power or an engine-generator system be used. The energy cost should be evaluated from an operating cost (cost per horsepower-hour) and initial cost standpoint.